In 2008, members of the Black Ash Grouse Trial Club in western Pennsylvania decided to change the format of the then 30 year-old The Armstrong-Umbel Classic from a one to two-hour stake making it the only endurance stake in the grouse woods. Historically, there was a precedent for extended-period stakes in the grouse woods. From their inception, the Grand National Grouse Championship and the Pennsylvania Grouse Championship ran for two hours or more for many years, challenging the dogs’ endurance and stamina. Past reports from those trials suggest that the gradual change to one-hour duration braces was due, primarily, to the inconvenience of running longer stakes with increasing number of entries. 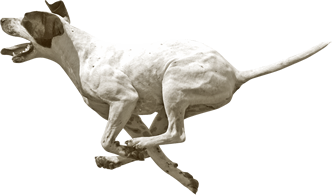 Reports also indicated that great value was placed on the endurance and stamina dogs exhibited in those early grouse dog championships. The Black Ash Grouse Trial Club felt that the grouse trial circuit was missing the opportunity to test and evaluate dogs for endurance and stamina—qualities essential to all class field trial/wild bird hunting dogs. The Classic in its two-hour format has successfully filled that gap for the past four years. It has been conducted to the highest of field trial standards, securing the services of judges with impeccable credentials from around the country. We are strong proponents of endurance stakes and are proud to have assisted the Armstrong-Umbel Endurance Classic establish itself in these early years. The Manitoba Championship is the oldest Canadian prairie championship, first run in 1902. This prestigious event was re-established in 1995 by the Broomhill Field Trial Association. Along with it was the formation of the Broomhill Field Trial Foundation, a scholarship fund that has benefited the children of the area. Each year, a portion of the entry fees are donated to the Scholarship fund. 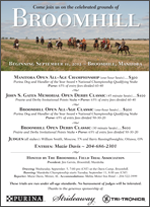 Strideaway has helped the Manitoba Championship and Broomhill trials with expenses over the past three years. As Mazie and I were already personally involved with these events, we were well aware of their need of financial assistance and naturally placed an emphasis on helping them through our efforts. We have asked several respected members of the field trial community from different parts of the country to help us make future decisions about where our financial support can make the biggest impact. We will continue to place our emphasis on wild bird trials through the country. Strideaway has operated as a not-for-profit since 2008 and are in the process of filing for that designation with the IRS (non tax exempt status).